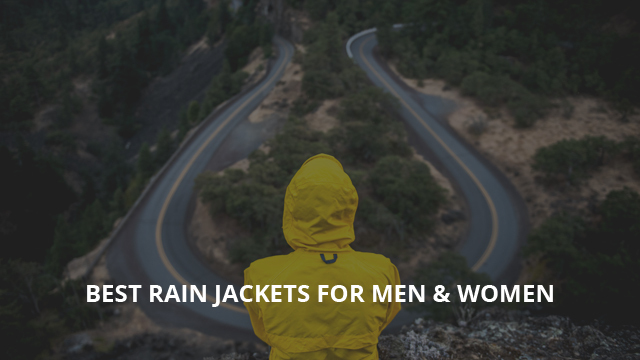 Since a lot of people land on our site searching for rain jackets on the internet, we thought it fitting to select eight of the best you will find in 2019. These jackets were chosen for their high quality, weather-resistance and, to keep things fair and square, for their high online ratings and satisfied users. As it is typical with these reviews on our site, there will be a selection for men, as well as women. Let’s take a look! 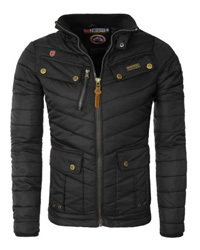 We will be starting with the men’s selection and first up is Trespass’ Qikpac jacket. 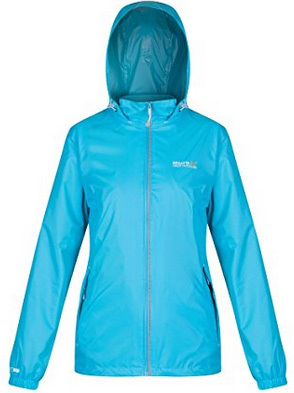 This is a waterproof jacket with a water column of 5000mm. Not just that, but it is also very breathable, helped by a ventilation zip on the back. The material is 100% Nylon, with the inside being mesh fabric for breathability. The seams are taped, which help to completely prevent rain from getting through. There are two outer pockets on this jacket and it comes with an elastic collar, with an attached hood. The cuffs are elastic, whereas the bottom hem has a drawcord for adjustment. Inside there is also a storm flap, to keep you fully protected. A great benefit of this jacket is that it packs away into a pouch, taking very little space. It is available in the color: Grenadine, Gecko, Sasparilla, Black, Sunrise, Navy, Cobalt and Leaf. 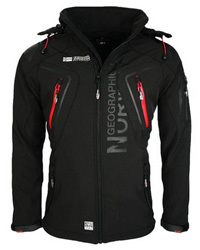 This windbreaker by Geographical Norway is a fully insulated and weatherproof jacket, made of 100% Polyester. It has an attached hood, adjustable with drawstrings on both sides. The main zipper is waterproof and concealed, as are the zippers on the side pockets. It comes with elastic cuffs and an adjustable hem. This jacket is part of the Dry Tech 4000 series, not just weatherproof but also quick to dry and resistant against wear and tear. The inner lining is mesh fabric, for breathability. Along with the jacket, there is a travel bag for easy storage. There are five color options: Red, Navy, Black, Grey and Royal blue. Next we have Pack It by Regatta. 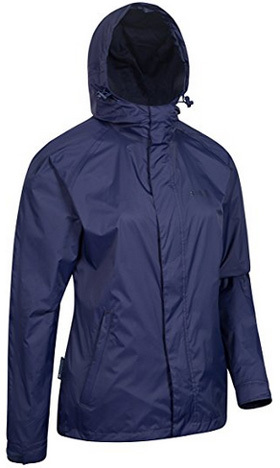 This waterproof jacket comes with taped seams for better resistance against water and also has a windproof membrane. It is made of 100% Nylon, lightweight and breathable, part of the IsoLite 5000 collection. The hood is attached to the collar and they are both adjustable. The main zipper is covered by a storm flap and both cuffs, as well as the bottom hem are elastic. There are two side pockets, with zipper closures. This makes a great jacket for mild temperatures, but the best thing about it, is that it can be used as a protective layer. This is because of it being slightly oversized and very lightweight, which will not bulk up the clothing, nor will it weight you down. The color selection includes: Navy, Bay leaf, Magma, Oxford blue, Black and Pepper. To conclude the men’s selection, we have chosen Core by Adidas. 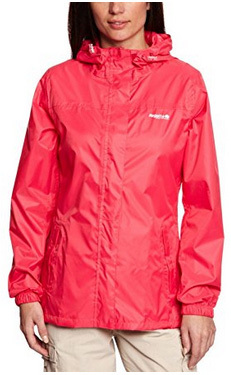 This rain jacket is made of Nylon and comes with two side pockets, elastic cuffs and an adjustable lower hem. The collar closes up quite high and there is an attached hood, which can be adjusted to size. 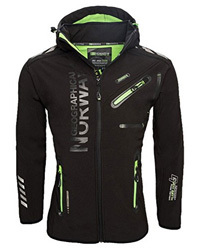 The main zipper is water-resistant and concealed. 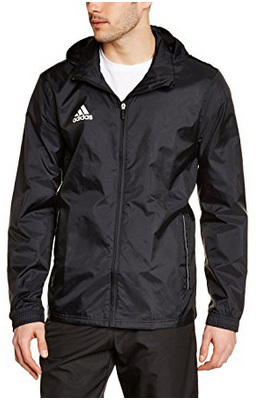 This jacket is highly water-resistant and wind-resistant and it is best used in wet and cold weather as it is not breathable, which can be an issue for warmer temperatures. It comes in the colors: Black, Dark blue, Power red, Marine. Much like with the men’s selection, the women’s jackets are also by renowned brands. The first two ones are by Regatta. Pack It, is the women’s version of the jacket included above. 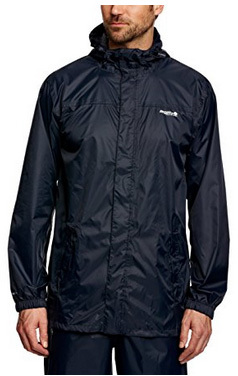 This lightweight nylon jacket is waterproof and highly breathable, also part of the IsoLite 5000 fabric series. There are two side pockets on the outside and one smaller pocket on the inside. The sleeves are slightly oversized, with elastic cuffs for insulation. The bottom hem is adjustable and it comes with a covered main zipper. It has an attached hood to the elastic collar. There are five colors to choose from: Midnight, Blueberry pie, Bright blush, Ceramic and Purple cordial. Corinne III is the ideal rain jacket for everyday wear. 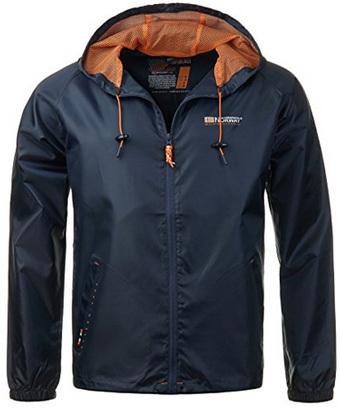 It is lightweight, stylish and completely weatherproof. Just like the previous jacket, this one is also part of the IsoLite 5000 series, with a 100% Nylon membrane, that is highly breathable, apart from being wind and waterproof. There is an attached hood and a short collar that closes up with the main zipper, which is uncovered, but water-resistant. It comes with elastic cuffs, two side pockets and an adjustable lower hem. There are thirteen color options available, including: Blue, Red, Viola, Rosa, Pink and Lime. 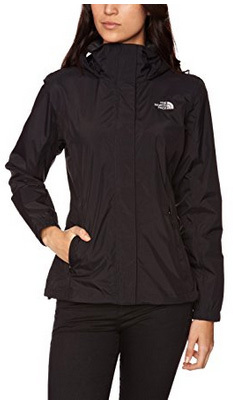 By The North Face we have selected Resolve, a hardshell jacket, suitable for cold and rainy weather. It has a DryVent membrane, which is both waterproof and windproof, with welded seams for a complete protection. The outer membrane is 100% Nylon, while the inner mesh lining is 100% Polyester, highly breathable. It has a high collar, which chin guard to prevent chaffing from the main zipper, which is covered by a storm flap. The hood is attached to the collar, but can be stowed underneath it, when not in use. It comes with two zipper pockets on the sides and an adjustable lower hem. The cuffs are elastic and there are nine colors available, some of which include: Black, Mid grey, Balsam blue and Clear lake. And lastly, it is Torrent by Mountain Warehouse. 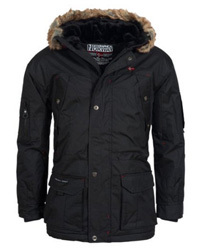 This jacket is made of a 100% Nylon membrane, with an inner lining of 100% Polyester. The seams are fully taped and it has a water column of 2000mm. 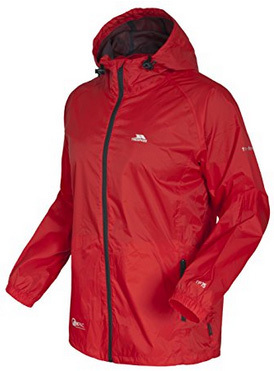 It is a really lightweight jacket, great as an outer membrane against the elements. There is a high collar, with an attached hood and a main zipper covered by storm flap. The cuffs are adjustable by Velcro and there are also two zipped pockets on the sides. Torrent is available in the colors: Navy, Purple, Orange, Yellow, Bright pink, Teal, Dark teal and Light brown.